Only a few piers have truly unique features and this pier is one of them. 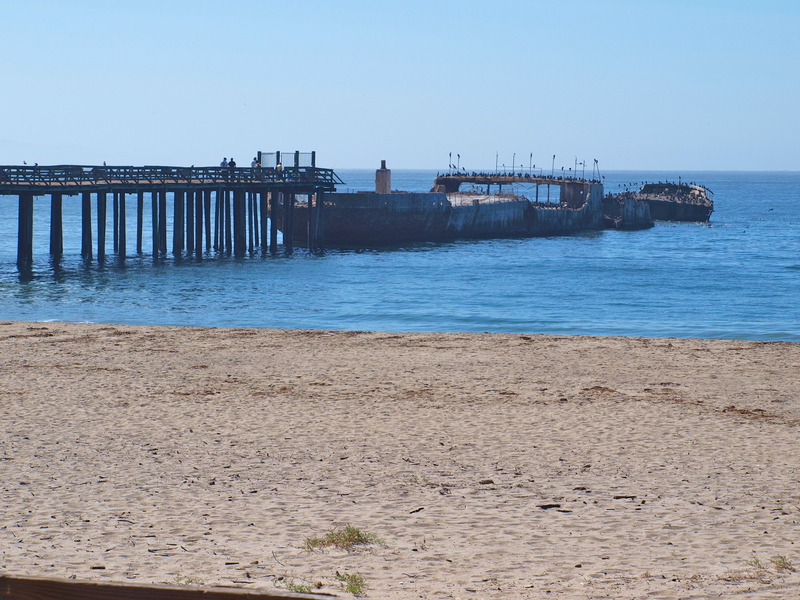 The end of this wooden 500-foot-long pier connects to the old cement ship Palo Alto, a bad idea turned good. The ship was designed for the U.S. Navy in World War I but was not completed until the war was over. 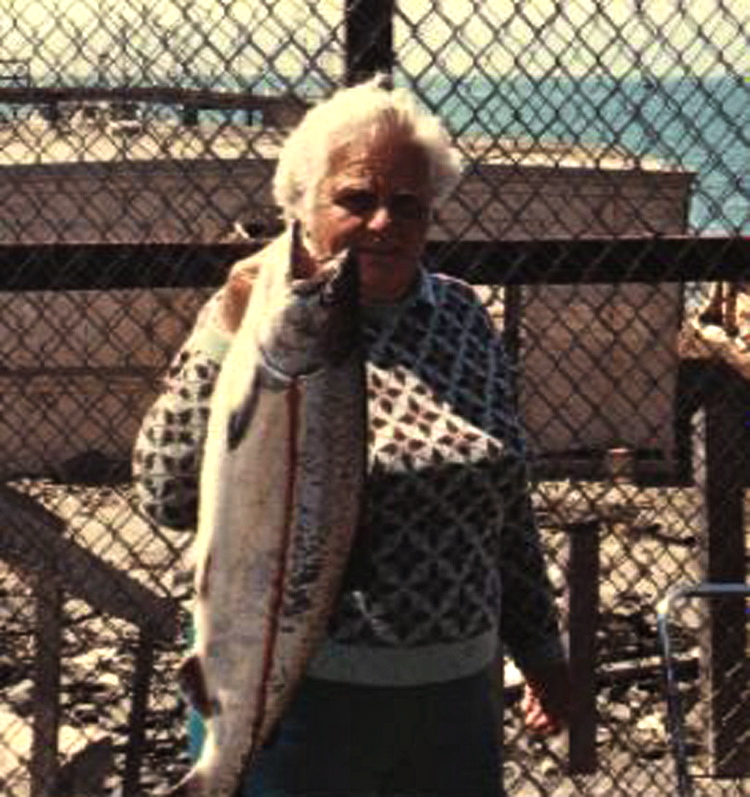 She sat at her dock in Oakland until 1929 when she made her only voyage—to her present spot. The 435-foot-long ship was filled with water, a pier was built from the beach to the ship, and the ship was turned into a floating attraction (although she didn’t really float). A cafe was constructed above deck, the main deck was turned into a dance floor, a heated swimming pool was added and carnival booths lined the back of the ship. 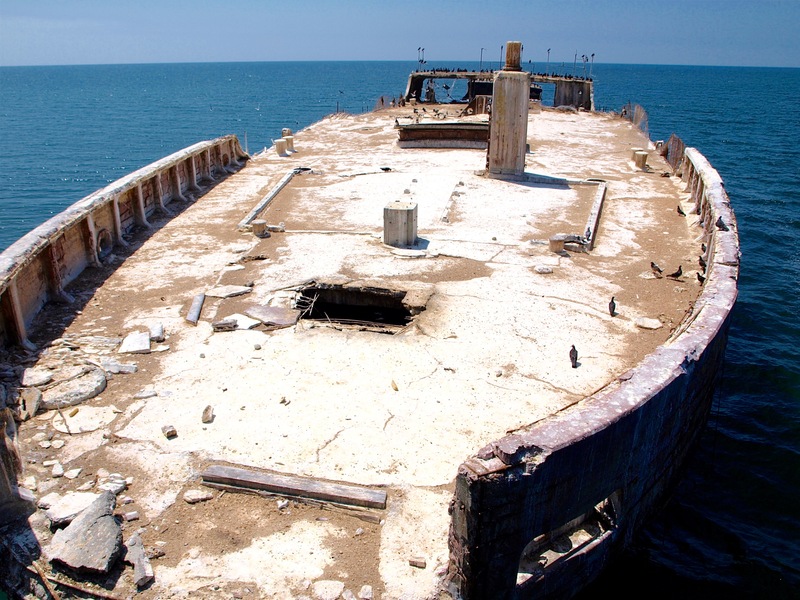 Within several years, the company that owned the ship went bankrupt. Later, winter storms damaged the already paralyzed craft. Although the ship was a bad idea for the company’s investors, it has turned out to be a bonanza for anglers. Environment. Seacliff State Beach is a sandy beach that connects with New Brighton Beach to the north and Rio Del Mar Beach to the south; all are noted beaches from which to catch surfperch. A short distance south of the pier sits the outlet of Aptos Creek. 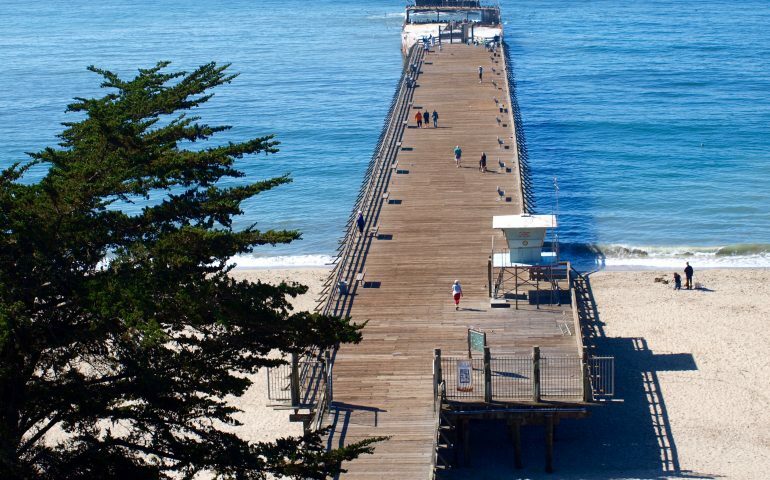 The park and pier sit in a pocket of Monterey Bay known as Soquel Cove, an area seasonally filled with baitfish and correspondingly frequently home to larger species—halibut, striped bass, white seabass (some years), and thresher sharks. 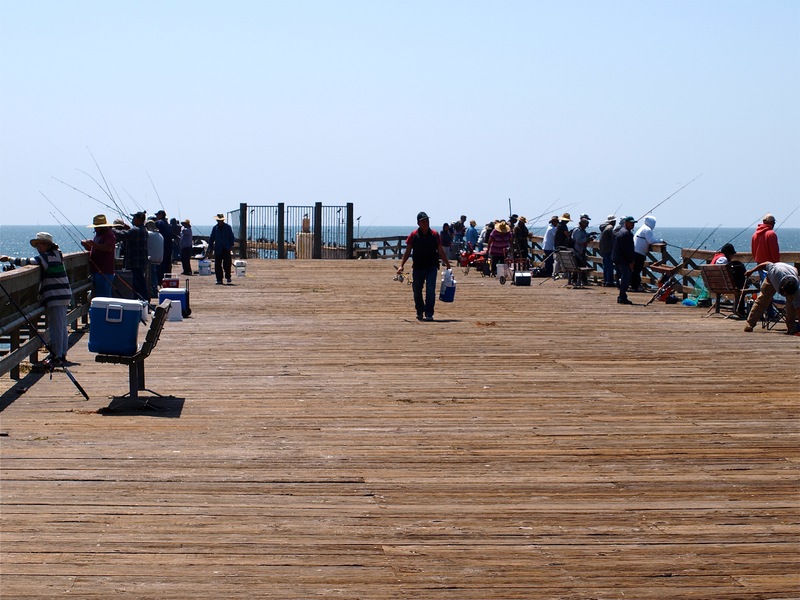 Pier anglers can encounter two distinct environments depending upon where they fish. The first is the typical sandy-shore environment found under and around the pier. The second environment is that found near the ship itself and today, because access to the ship is prohibited, it is less important in nature. Water depth at the pier though is only shallow to moderate and the fishing, for the most part, is for the smaller species. In the surf area, the angler can expect to catch both barred and calico surfperch (with the ratio of barred to calicos being about 3-1). Further out, in deeper water, anglers may see hoards of shinerperch, walleye surfperch and silver surfperch. Less common but caught most years will be white seaperch, spotfin surfperch, and a few sharpnose seaperch. Kingfish (white croaker—numerically the number one fish at the pier), starry flounder, sand sole, English sole, Pacific sanddab, jacksmelt, and (some years) baby bocaccio, round out the catch for the smaller species. 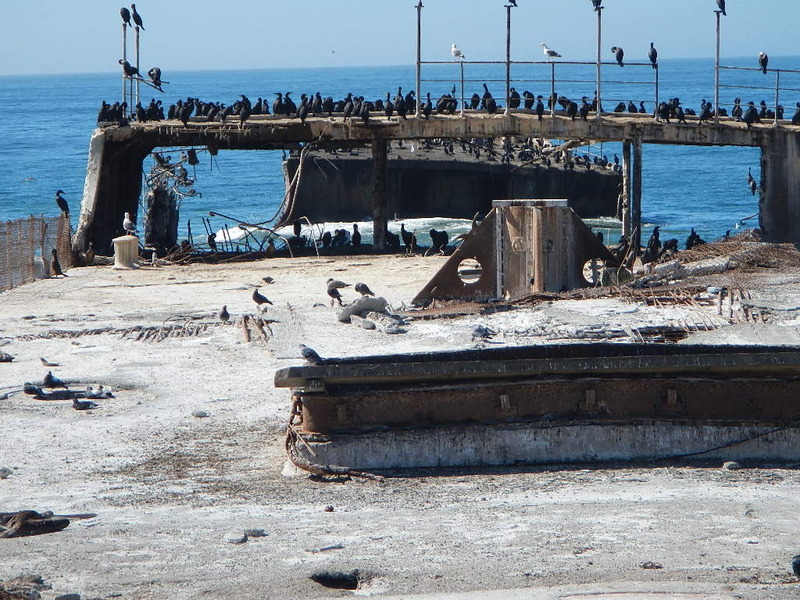 This same mid-pier to the end area will yield up pelagics when they enter the local waters. Spanish mackerel (jack mackerel) are common most years, the sardines have returned and are also common, while Pacific mackerel visit some years. Most people fish for these with Sabiki-type rigs and use the fish for bait although others will fill a bucket and use them for food. 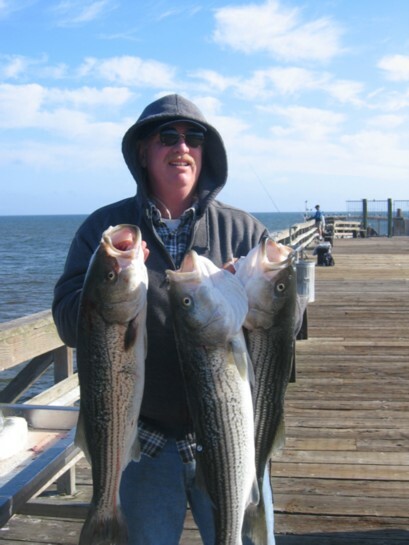 Most years will also see some king salmon, striped bass and California halibut landed, most commonly in the summer to fall months, and generally by the locals putting in their time on the pier. Increasingly, in the mid-to-late ’90s, white seabass have also entered into the picture (and a 45-pound fish was landed in August of ’00). Warm water years may also bring species more common to the south and both kelp bass and sand bass have been reported from the pier. 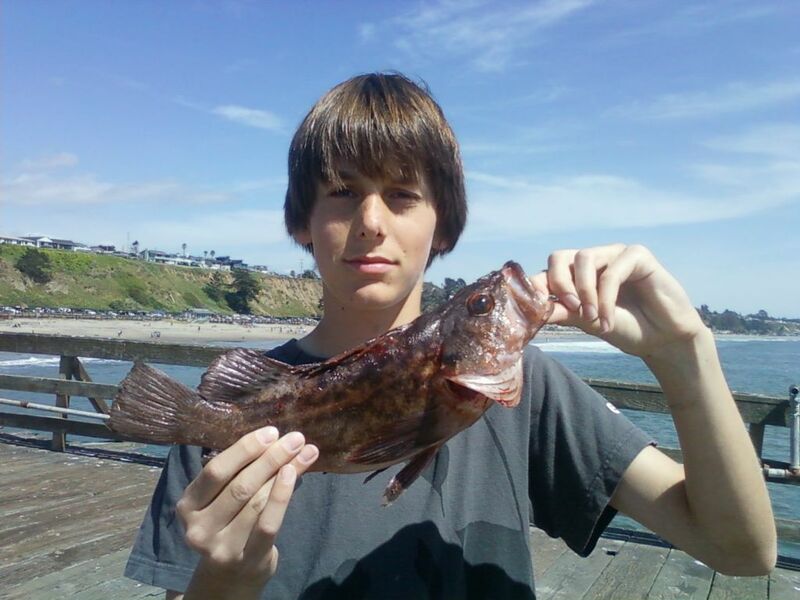 Fishing out at the end of the pier, and casting up next to the ship, may yield all of these species but may also, depending on the time of the year, yield pileperch, rubberlip seaperch, blackperch, rainbow seaperch, and a few small cabezon and kelp rockfish. For something a little different, a few steelhead will also generally be landed during the fall and early winter months most years. 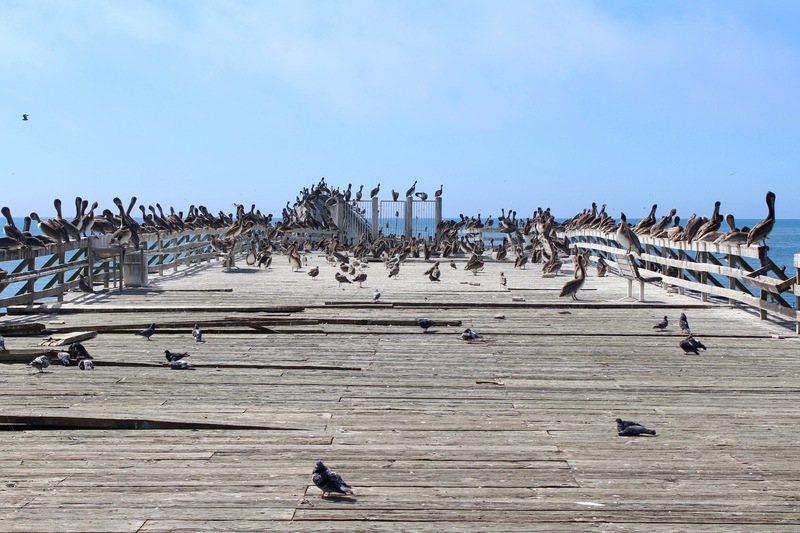 This is yet another pier that occasionally sees too many pelicans, although rarely the number seen at Santa Cruz. 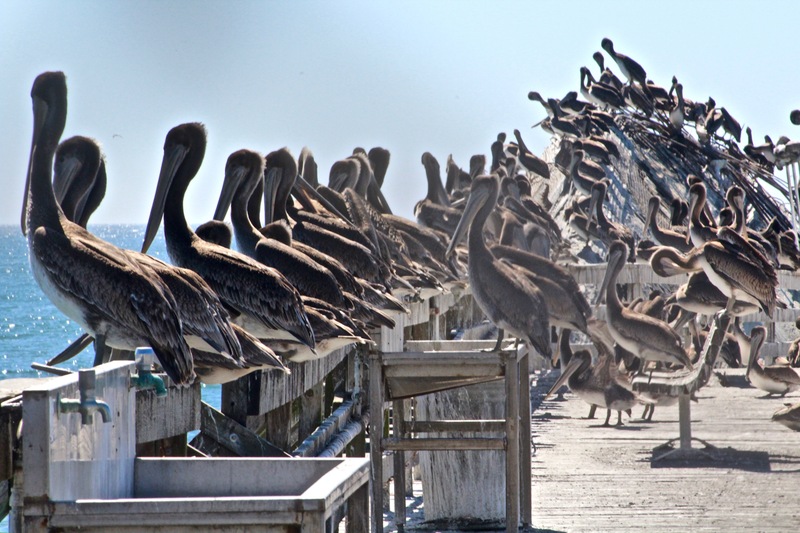 Nevertheless, the pier was shut down several days in August of ’08 to protect the number of pelicans accidentally being hooked by anglers. A word of caution! This can be one of those piers where the regulars think they own the pier and to some degree don’t mind making life miserable for the non-regulars. Of course when a regular has a half dozen rods, has been drinking (or doing drugs), and seems to be camped out on the pier, it can almost be expected that there could be problems. I’ve seen it a couple times, both times when the stripers and halibut were biting, and was somewhat surprised no one raised a fist. I was even more surprised that the park rangers didn’t have better control of the problem. Hopefully it’s been corrected. The pier is crowded when the fish are biting. Fishing Tips. Whenever possible, fish the surf area with live sand crabs (soft shell are best); if these aren’t available, use pile worms, ghost shrimp or fresh mussels for bait. 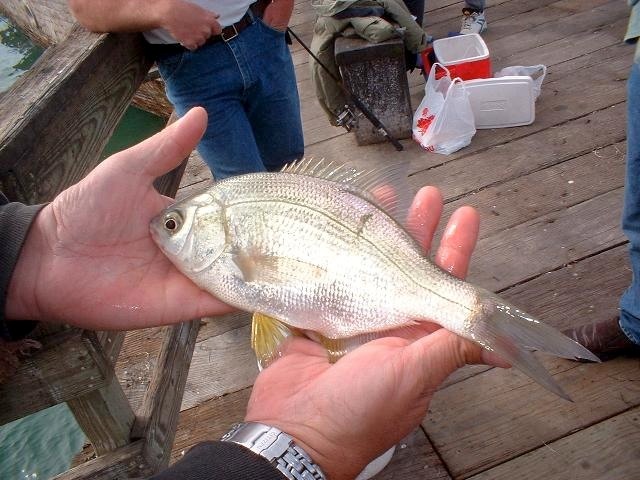 Winter is the best time for large barred surfperch, winter and spring for the calico surfperch. Motor oil and root beer colored grubs can also be used for these perch and since this pier is built close to the water it’s a good place to try your artificial lures. Add some shrimp scent to the grubs for increased production. However, the surf here is typically only moderate and I haven’t had as much luck with the plastic grubs as at beaches with heavier surf. Do try to hit the pier near high tide if you’re seeking out the perch, two hours before to two hours after are the peak times. 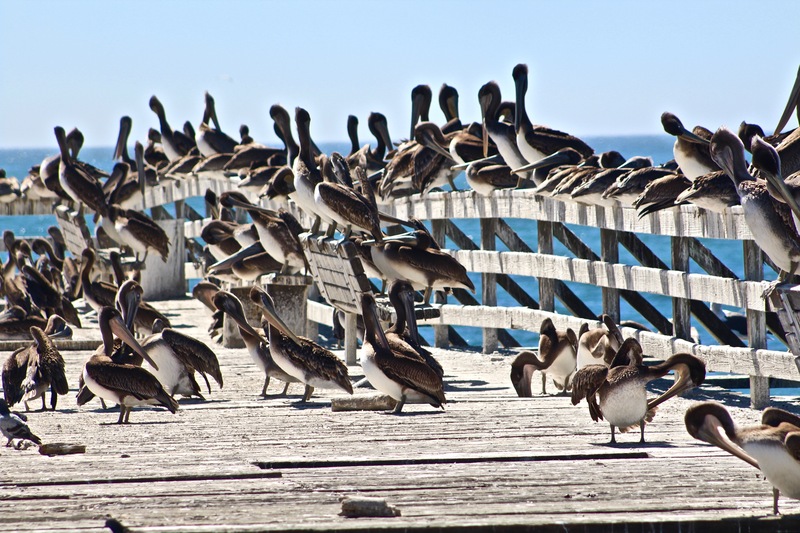 If you do use an artificial lure, be careful of the nearshore bathers and the crowds on the pier. One day I saw a young girl get hooked in the face by the errant actions of an equally young boy. She was simply walking on the pier, he was paying no attention to anything except his friends. Having trouble casting a lure that was far too light for his tackle, he whirled it about and impaled the young girl with the treble hook of his lure. It was not a pretty sight. In the mid-pier area, fish on the bottom using anchovies for sand sole, starry flounder and white croaker. Sole bite best in the spring, the flounder winter to spring, and the kingfish summer to fall (although some winters see large concentrations of these small croakers). Use a small piece of anchovy and fish mid-depth for walleye and silver surfperch. Fish near the top of the water and use pile worms for jacksmelt. 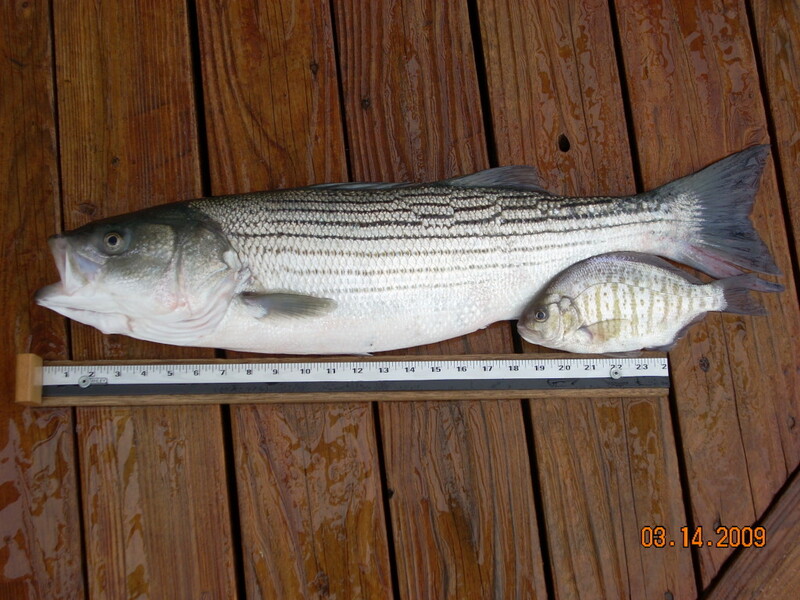 From June through August, use a live shiner, smelt, sardine (or small mackerel when available) and fish on the bottom for halibut and stripers; fish with the same bait but near the surface for salmon. A plethora of different lures are used for the stripers; a few of the best are Hair Raisers, i.e., Spro bucktails, Pencil Poppers, Lucky Craft Pointers and white swim baits. Halibut like soft plastics with Big Hammer, among others, being a favorite. Again, the pier can be very crowded so take care to insure that you do not tangle lines or endanger anyone. Some years will also yield a few steelhead during the late fall months; most of these will be landed on worms or small lures. Out at the end of the pier you can try a long cast right next to the old ship. The ship itself, the underwater holes that allow fish to enter the inside of the hull, and, I am sure, the reef-like growths that have developed over the years, act as a fish attractant for several rocky-area species. If seeking out perch, the typical bait is pile worms, fresh mussels or small pieces of shrimp along with small hooks, size 6 or 8. One favored species is large rubberlip seaperch and bait or plastic grubs can catch them, especially root beer-colored plastic grubs. Although much harder to catch today than when you could actually fish from the ship, fish are caught each year. Keep the grub moving and be ready for a hard strike from these large perch. Also, use a fairly heavy drag on your reel and try to keep the perch moving toward you. If you don’t, the fish will often rub the fishing line against the ragged edges of the ship. This area will also yield quite a few rockfish, (mostly 9-13” browns) along with an occasional cabezon or small lingcod. If seeking out the rockfish, cabbies and lings use a larger hook and don’t be afraid to try anchovies or strips of squid for bait. The deeper waters will also yield a few sharks, mainly smoothhounds or leopard sharks (including a nearly five-foot-long fish in August of 2009), Rays too will show up including bat rays, skates and surprisingly a few thornback rays. Although not a noted pier for large sharks, some years do provide decent action as seen in 2008 when large numbers of thresher sharks were reportedly taken over the summer months. Some years will also see a few species more common to the south, i.e., two shovelnose guitarfish were caught in July of ’06.